With heavy hearts, we announce the passing of our beloved dad and grandpa, Alberto (Chapo) Montoya, 88, of Tortugas. He passed away at his home surrounded by his family on January 31, 2019. He was born on November 19, 1930 to Alberto and Margarita Montoya in Tortugas, New Mexico. Chapo, as he was fondly known to many, spent his early years playing baseball. 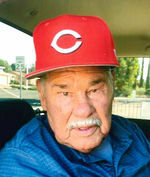 He was one of the original Tortugas Red Caps. His favorite team was the Cincinnati Reds. Alberto spent 34 years as a heavy equipment operator with Dona Ana County Road Department until his retirement in 1989. Alberto is survived by his son Alejandro ‘Alex’ Montoya, (wife Nancy), daughter’s, Bertha ‘Birdie’ Zepeda (husband Amador) and Viola ‘Mickey’ Gonzales (husband Rick). Seven grandchildren, Josh Zepeda (wife Maria), Omar Montoya (wife Trista), Nick Zepeda (wife Justie), Matthew Montoya (wife Stacey) Jeremy, Kassandra and Zack Gonzales. Thirteen great-grandchildren, Joseph, Elijah, Ian, Angelyna, Mason, Corby, Matyson and DJ Zepeda, Jonah, Judah, Aiden, Autumn, and Adelynn Montoya. 3 brothers, George Montoya (wife Mary) of Tortugas, Andres Montoya (wife Adelita) of Mesilla, and Felix Montoya (wife Luz) of Tortugas. 2 sisters, Josephina (Fina) Estrada of Tortugas and Delfina (Delfie) Naranjo of Silver City and special niece Margaret Cockette Romero, as well as many nieces and nephews. Predeceased by his wife of 56 years, Lily Helen Montoya, his baby son Alberto III, parents Alberto and Margarita Montoya, 2 brothers, Felix Montoya and Eugene (Heno) Montoya. 3 sisters, Isabel (Chavela) Salcido, Inez (Nay) Hernandez and Josefa (Pepa) Morales,cousin Reyes Montoya grew up like brothers. Visitation for Alberto (Chapo) will be held from 6 pm to 7 pm, Thursday February 7, 2019 at Our Lady of Guadalupe Shrine and Parish with rosary to follow at 7 p.m. A funeral mass will be at 10 a.m. Friday February 8, 2019 also at Our Lady of Guadalupe Shrine and Parish, burial will follow at the Tortugas Cemetery where he will be laid to rest beside is beloved wife. Pallbearers will be his grandchildren, Josh and Nick Zepeda, Omar and Mathew Montoya, Jeremy, Kassandra and Zack Gonzales.